Indoor unit is detecting error signal from remote controller (and system controller). E01: Error in receiving serial communication signal. E02: Error in transmitting serial communication signal. E03: Indoor unit is detecting error signal from remote controller. E04: Error in receiving serial communication signal. When turning on the power supply, the number of connected indoor units does not correspond to the number set. E06: Error of the outdoor unit in receiving serial communication signal from the indoor unit. E08: Indoor unit address setting is duplicated. E09: Remote controller address connector. E12: Starting auto address setting is prohibited. This alarm message shows that the auto address connector CN-A.ADD is shorted while other RC line is executing auto address operation. E15: Error in auto address setting. E16: Error in auto address setting. E20: No indoor unit is connected during auto address setting. E24: Main outdoor unit is detecting error signal from sub outdoor unit. E25: Error of outdoor unit address setting. 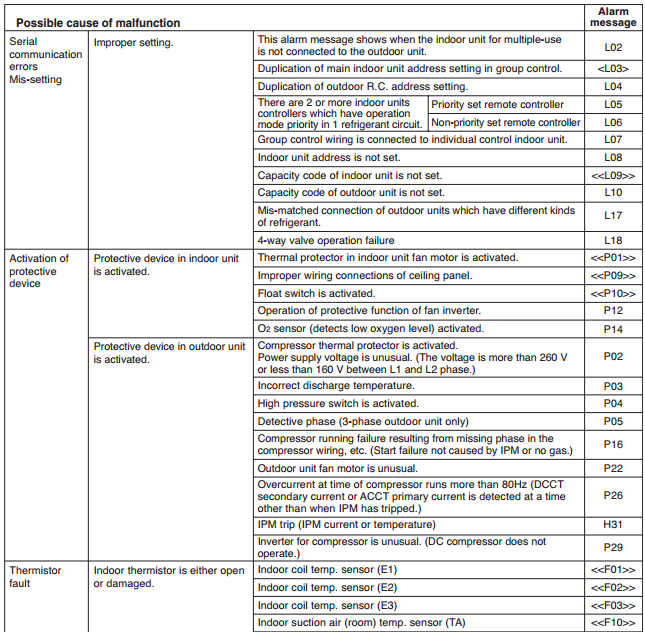 E26: The number of connected main and sub outdoor units do not correspond to the number set at main outdoor unit PCB. E29: Error of sub outdoor unit in receiving serial communication signal from main outdoor unit. E30: Transmission from outdoor unit faulty. E18: Error of main indoor unit in receiving serial communication signal from sub indoor units. L02: This alarm message shows when the indoor unit for multiple-use is not connected to the outdoor unit. L03: Duplication of main indoor unit address setting in group control. L04: Duplication of outdoor R.C. address setting. L05: Priority set remote controller. L06: Non-priority set remote controller. L07: Group control wiring is connected to individual control indoor unit. L08: Indoor unit address is not set. L09: Capacity code of indoor unit is not set. L10: Capacity code of outdoor unit is not set. L18: 4-way valve operation failure. P01: Thermal protector in indoor unit fan motor is activated. P09: Improper wiring connections of ceiling panel. P10: Float switch is activated. P05: Power supply circuit failure, missing-phase detection. P13: There is a trouble with the outdoor unit when the liquid valve and the gas valve are closed. P16v: Compressor running failure resulting from missing phase in the compressor wiring, etc. P22: Outdoor unit fan motor is unusual. F31: EEPROM on the outdoor unit PCB is a failure. C05: Indoor or main outdoor unit is not operating correctly. Mis-wiring of control wiring between indoor unil, main outdoor unit and system controller. 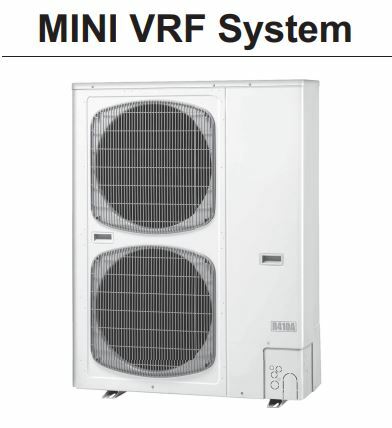 C06: Indoor or main outdoor unit is not operating correctly. Mis-wiring of control wiring between indoor unit, main outdoor unit and system controller. CN1 is not connected properly. P30: When using wireless remote controller or system controller, in order to check the alarm message in detail, connect wired remote controller to indoor unit temporarily. Trouble: The power LED on the outdoor unit control PCB does not turn ON. Cause and correction: Check for any errors in the power wiring to the outdoor unit, and check for a missing phase. Trouble: LED 1 and 2 on the outdoor unit control PCB do not turn OFF when the outdoor unit power is turned ON, and automatic address setting cannot be started. 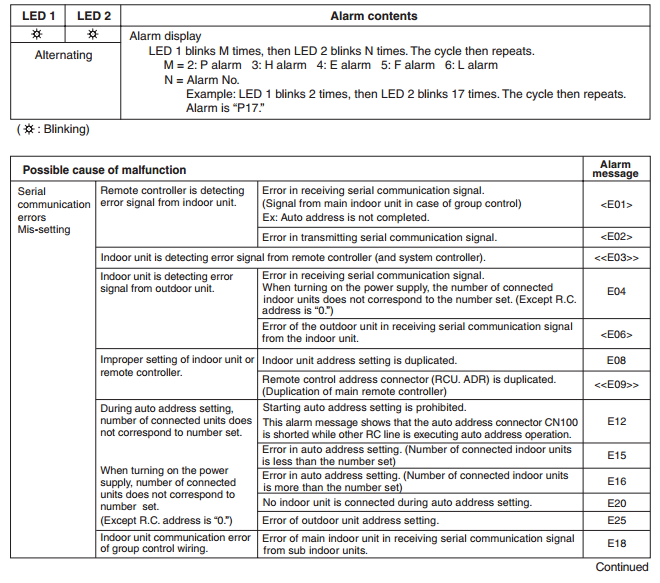 Cause and correction: Check the “Alarm Displays” table and correct the problem. Trouble: An alarm appears immediately when automatic address setting is started from the remote controller. Trouble: Nothing happens when the operator attempts to start automatic address setting from the remote controller. Cause and correction: Check that the remote controller wiring and the inter-unit control wiring are connected correctly. Check that the indoor unit power is ON. Trouble: An alarm appears on the remote controller sometime from several seconds to several minutes after automatic address setting is started. 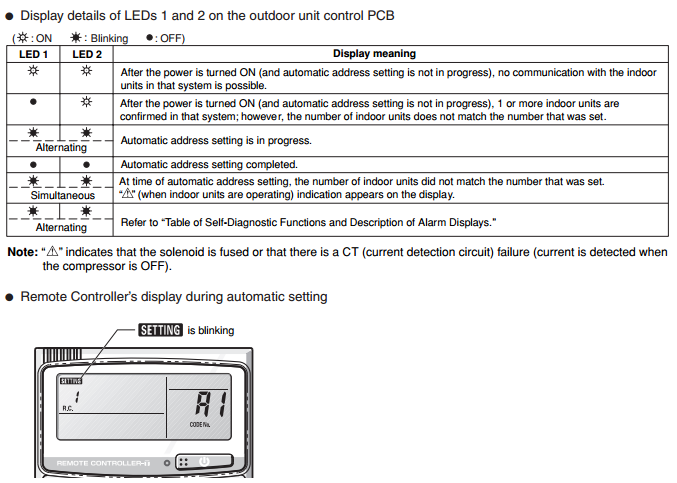 Cause and correction: Check the alarm details on the “Outdoor Unit Control PCB LED 1 and 2 Alarms” table, then check the “Alarm Displays” table and correct the problem.